With the combo you can easily add 2xUSB3.0-Port Hub and HD Audio Port to your desktop, from its USB3.0 connector and Audio Connector. Data transfer rate up to 5Gbps. With 19PIN USB3.0 interface and support HD-AUDIO audio Main board or adapter card and Free floppy drive chassis. 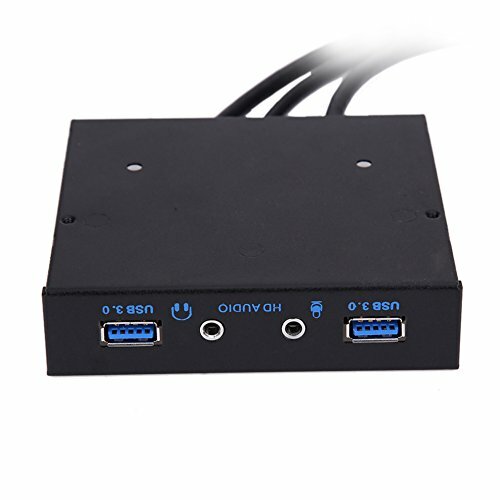 Combo Floppy Device: 2xUSB3.0-Port Hub and HD Audio Port to your desktop, from its USB3.0 connector and Audio Connector. High Speed:Superspeed 5Gbps transfer rate. Compatible with USB 2.0 and 1.1. Hardware:With 19PIN USB3.0 interface and support HD-AUDIO audio Main board or adapter card and Free floppy drive chassis. Easy Use:Plug&Play, no driver needed. Package Content:1 x USB3.0+HD-AUDIO Front Panel;1 x Audio Cable; 5 x Screws. If you have any questions about this product by WinnerEco, contact us by completing and submitting the form below. If you are looking for a specif part number, please include it with your message.